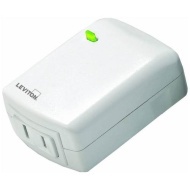 alaTest has collected and analyzed 4 reviews of Leviton Decora Smart Wi-fi Plug-in Dimmer. The average rating for this product is 2.9/5, compared to an average rating of 4.5/5 for other products in the same category for all reviews. We analyzed user and expert ratings, product age and more factors. Compared to other products in the same category the Leviton Decora Smart Wi-fi Plug-in Dimmer is awarded an overall alaScore™ of 96/100 = Excellent quality. This $30 smart plug puts anything you plug into it under Alexa's or Google Assistant's control. Leviton's Wi-Fi smart plug works perfectly with Alexa and Google Assistant, and you don't need a hub in order to use it. The slim-bodied design won't block adjacent outlets after you've plugged it in. The plug doesn't work with Apple HomeKit, so you can't control it with Siri, and it won't track energy usage. It also doesn't include any USB charge ports. This is a basic, no-fuss smart plug from an established manufacturer that gets the job done without costing too much. Plug a lamp into this Leviton Decora smart plug, and you'll be able to tell Alexa to dim it up and down. The dimmer's bulky design blocks off any outlets below it, and you'll need to plug your lamp into the bottom of the device, which can be a little awkward. There also aren't any significant third-party integrations beyond Alexa. This Alexa-compatible plug-in smart dimmer gets the job done, but alternatives from Belkin, Lifx, and Philips Hue are all more fully featured, and more cost effective, too. Leviton's Wi-Fi dimmers and switches are a few integrations shy of greatness.